I Skate, Therefore I Am: A Dogtown saga: from The cove to the Dog Bowl to Marina Del Rey to Polar Bear Skatepark. A Dogtown saga: from The cove to the Dog Bowl to Marina Del Rey to Polar Bear Skatepark. The Venice Pit is a special spot in skate history, past and present. Until now, Venice skate park was more known for what is “was”: a solid skate scene from what is commonly considered the birth place of vert skateboarding: Venice (and Dogtown) is the place where Tony Alva, Jay Adams, Stacy Peralta and other pro skaters, with the help of Skip Engblom and Jeff Ho created the Zephir team. Engblom and the The Z-Boys frequented a locals-only surf spot named "The Cove," which was located at Pacific Ocean Park, in Santa Monica, which later burned to the ground. Apart from being the owner of the Zephir Skate Team, Skip Engblom was one of the co-founders of the Jeff Ho Surfboards and Zephyr Productions Surf Shop in Santa Monica, California. He currently owns and runs Santa Monica Airlines. Engblom was never a remarkable skateboarder himself but was a big influence to the Zephyr team. By sponsoring the Z-Boys, Engblom was the reason why the boys were so aggressive in their skating and started competition. The epic story of the Z-Boys has been related in several movies, including "Dogtown and Z-Boys" and “Lords of Dogtown”. At the end of the 70’s, an ambitious, 24 year old local surfer/skateboarder type building contractor with a recent degree in Construction and Architecture from SMCC named Dennis Ogden developed what would become the Mother of all skateparks at Marina Del Rey, a couple of blocks from Venice beach and The Santa Monica pier. The Dog Bowl was Tony Alva’s own skatepark. The Park was up and running by November, 1978. The initial skating area consisted of three pools complete with tile, coping and a special plaster, a 10’ deep half pipe with a capsule end, two intermediate “brown” bowls, a beginners bowl area, a 230 yard long slalom with smooth transitioned banks, and a large freestyle area with gentle sloping banks. 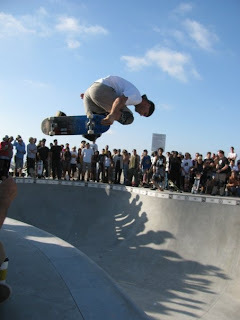 There is a wonderful web site that tells the story of Marina Del Rey skatepark with original pictures and photos from Skateboarder magazine at: http://www.marinadelreyskatepark.com/index.html. There also used to be a small skate park at an outdoor pavilion at Venice called the "Pit" or "Graffiti Pit". This was the Dogtown scene. Unfortunately, Marina del Rey was tore down in the fall of 81 and the Graffiti Pit was demolished in the summer of 2000 in an effort to "clean up the area" and remodel that section of the Venice boardwalk. The old Venice scene wasn't even much of a skatepark anyway. It looked like a standard school yard: concrete ledges and benches to ride, no trannies. Strictly tech, tech, tech. If you can find a copy of the skate video "Listen" you can see the park in action. Since the renovation, the City added a lovely "new skatedance area for skaters of all ages" and a couple of super-basic park features. If you're interested, the (old now) spot has one curved "bench" - complete w/ coping and transition - as well as a couple of ledges and some various 3- and 4-stairs. The skating is really excellent, but it's basically a street scene. 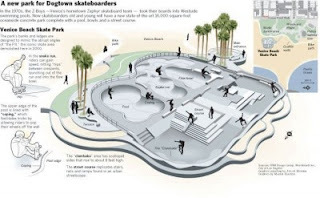 Then, when Venice Beach was renovated between 1999 and 2001, Dogtowners like GeriLewis, Jesse Martinez and other members of Venice Surf and Skateboard Association demanded a park in honor of Dogtown and helped the city by influencing its design. They say their job is not over: "There is still much work to do and in fact the hard part of the project has just begun. The VSA was not only established to build a skatepark but to represent and protect the rights of the surf and sk8 community." The Dogtowners also demanded that the park would be officially named after Dennis “Polar Bear” Agnew (one of the original Dogtown skaters who passed away a couple of years ago). Beach Skate Park one of the most challenging arenas for skaters to ride," touts L.A. City Councilman Bill Rosendal's office who openned the park. "The facility rivals other skate parks around the world but stands out as one of the only skate parks located on a beach." The initial meeting between the Dogtowners and the City took place in March '01 and it “just” took 8 years of intense tergiversations to unveil the new city’s beach-side skatepark. Designed by the famed Wormhoudt Inc. skate park company, It was only on February 2009 when construction began on the 17,000-square-foot Venice Beach Skate Plaza. And on a sunny Saturday October 2nd, eight months later, the $3.5 million in-ground concrete park full of bowls, ramps, rails, platforms, and steps and a bowl that mimics Dogtown's world of empty swimming pools and urban landscape where Jay Adams and Tony Alva invented pool riding finally openned. Because the name of this blog is “Pool Rider” Tony and Jay and Marina Del Rey skatepark (where I had the chance to skate) are part of my memories and it is not without a certain emotion that I am relating this opening. Is this “ The return of Dogtown”? 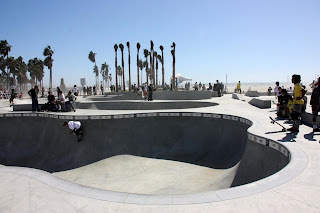 Actually, Jay Adams, Tony Alva, Jesse Martinez and Geri Lewis were announced to be among the professional and amateur skateboarding aficionados scheduled to christen the new $2.4-million Venice Beach Skate Park with a few ollies and tuck knees. But that did not happen: Jays Adams was surfing in hawaii, Tony Alva was on tour in Italy and they could not make it for the opening. 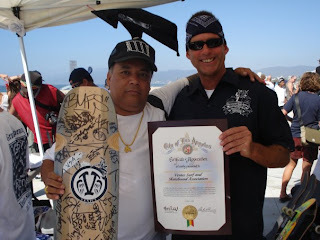 But there was some pretty good fellas to honor the park: Ben Harada, Eric “Tuma” Britton, Pat Ngoho, Eddie Reategui, Aaron Murray, Lester Kasai, Brian Patch and of course Christian Hosoi (Christian Hosoi’s father was the manager of the aforementionned Marina Del Rey Skatepark). When Mayor Antonio Villaraigosa and Councilmember Bill Rosendahl cut the red ribbon, the skaters went wild and the rest is history. Directions: Coming from Los Angeles, take Interstate 10 west to the 405 Freeway south. Exit the 405 at Venice Beach Boulevard and head west until you run into the beach. Cruise the boardwalk and find Muscle Beach [where all those oiled and greasy guys lift heavy stuff]. The "skatepark" is just north of that outdoor gym, and toward the beach a little. Look for those 10 ft concrete "cones" and the graffiti walls. If you have trouble finding the park you can ask anyone on the boardwalk, everyone seems to know where it's at. I rode on the Marina Del Rey Skate Park team in 1978-1979. in 1979 I won a gold and silver medel at the ASPO state championship for free style and pool riding.. My name is Adam Paul. 32 years later you can most certainly find me at the Dennis Agnew SK8park in Venice and I am still ripping. Thanks for this page, its very informative.